In 2018 I am activated Motta da Set a second time. The way to the summit is not difficult. 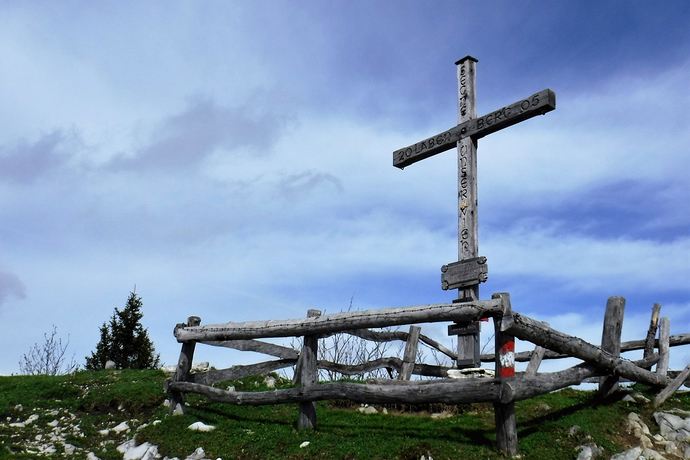 Starting near the village Bivio you will reach Pass da Sett after 4 km on a good way. After 1 km to the east in direction to Pass Lunghin the Summit is on the right of the path. 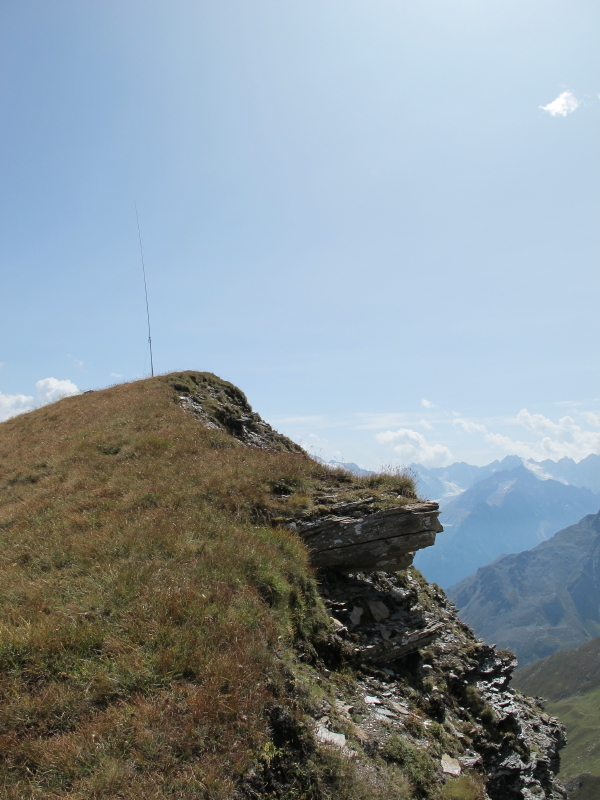 The ascent until here is only 500 m. The last 700 m distance and 200 m ascent to the summit is on a steep grassland. The way seems to be easy. 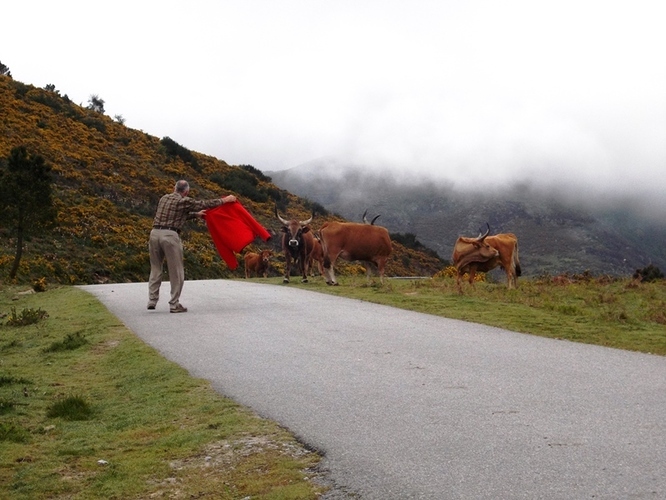 I saw about ten cows 100 or 150 m away from the highest point. 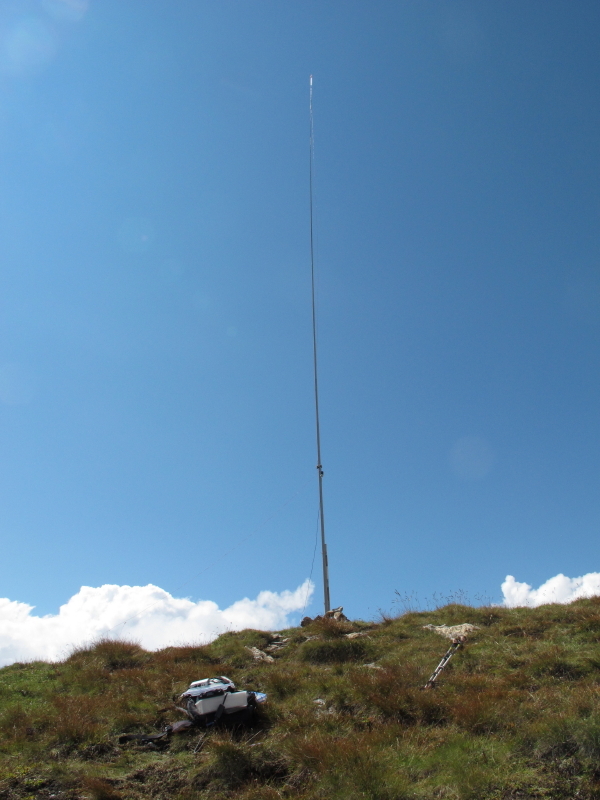 Like in 2017 I was starting to setup the station on the highest point, first unpacking the telescopic pole and material to fix the rod on the ground. 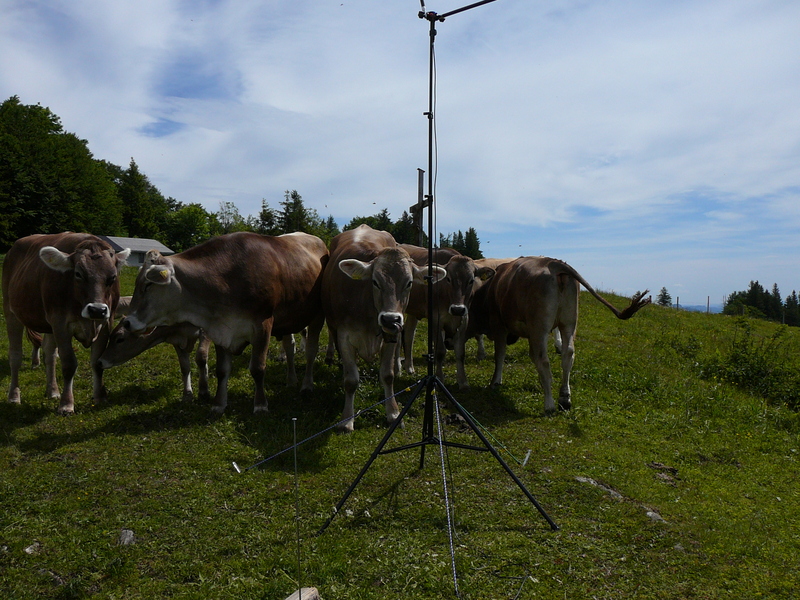 As the pole was mounted, not drown out, I was wondering about the volume of the cow bells. Looking over my shoulder I saw the cows coming direct to my place. The first was only 15 m or so away. After the next 15 or 20 seconds my position would be between the cows and the edge, where the terrain abrupt falls down. What would be if the cows want to occupy the whole place. They are stronger then I. So I snatched my rucksack and some other things, leave the pole alone and walk on the cow-free grassland 20 meters away. 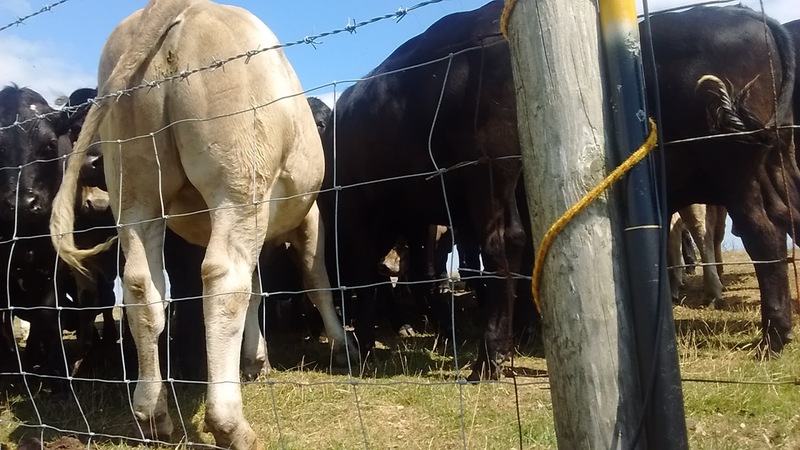 Right, the cows occupied the whole place, investigate the rod, licking the rod, bringing the rod down and staying there for a while. It took about 20 minutes until the last guest leave the summit. The summit was no longer a place of interest for the animals. Fortunately the pol was not broken (only licked ). With a delay the activation starts and was successful with 8 contacts. But every time I had one eye on the cows. 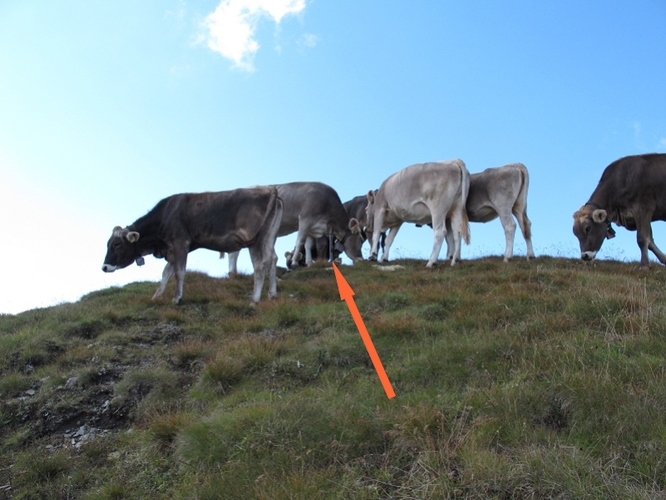 I like summits without cows much more than with these curious animals. I’ve had to deal with cows on a summit too and also with goats. My strategy with cows was yelling at them while facing them and moving towards them waving my arms and a the walking stick in my hand. It worked well and they all ran away apparently scared of me. With the goats it worked as well initially, but they soon returned one and again to my position. Fortunately, my dog did a very good job keeping them away at a safe distance which let me carry out my activation with no problems. It’s been two years since I liked to activate this summit. I hope to put it on the list this year, in late spring, in the company of my yl and sotadog. 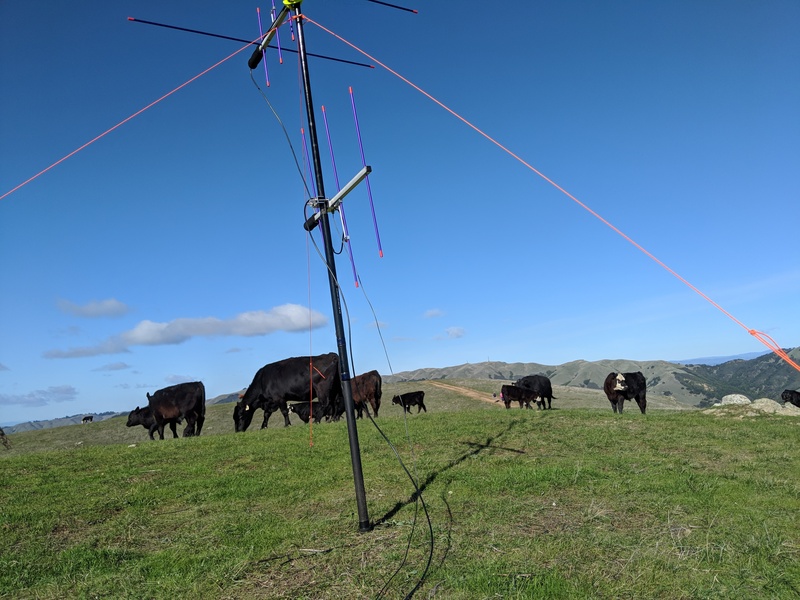 Also I had a bad experience with cows, coming back from a I/LO-154 Zuc di Camm, we had to escape from a bunch of cows, in this case they were very angry! Absolutely correct strategy. The more noise and action you can make the better. They hate ground noise so thumping the ground really disturbs them. However I avoid that if possible and have rarely had to resort to such approaches being noisy only in challenging situations when leading a walking group. Cows are always curious. In my youth I used to milk one by hand every morning and on a cold frosty morning.it is very warming to be up close. If you are ever with a dog when cows approach, let the dog go free. It will find its way out. Many of the people who have been trampled and injured or killed by cows have held onto their dog. 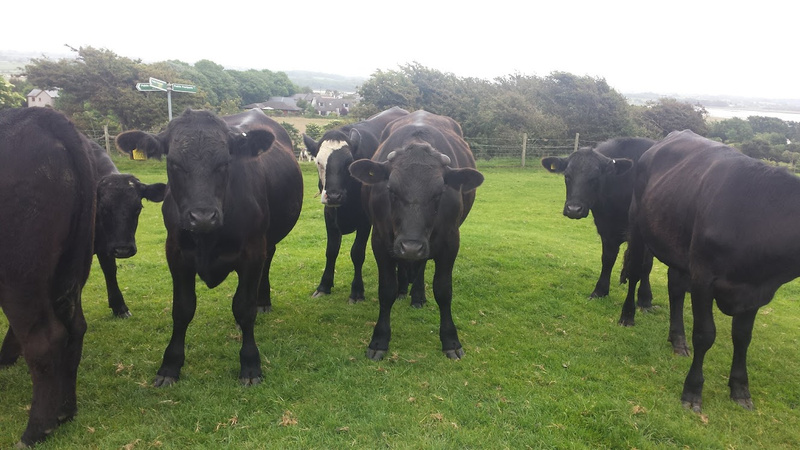 When you understand how to manage meeting cows there is nothing to fear. Lovely report and brilliant looking summit. Cows are curious. Whilst shouting and making a noise works, it can cause problems as shouting panic them and they can and do run into wire fences and will sometimes try to jump over objects they can’t really manage and injure themselves - or fall over a cliff!! I much prefer the quieter approach and simply herd/shoo them away gently - pushing the lead cow away 1st helps as the others may follow. Dave in Robin Hood’s Bay. A farmer told me that female cows with calves are more dangerous than bulls. Horns or no horns, they are very heavy. I sometimes get followed by young cows who are often very curious. Shouting and waving arms helps (until you stop doing it.). They can see dogs as a threat. 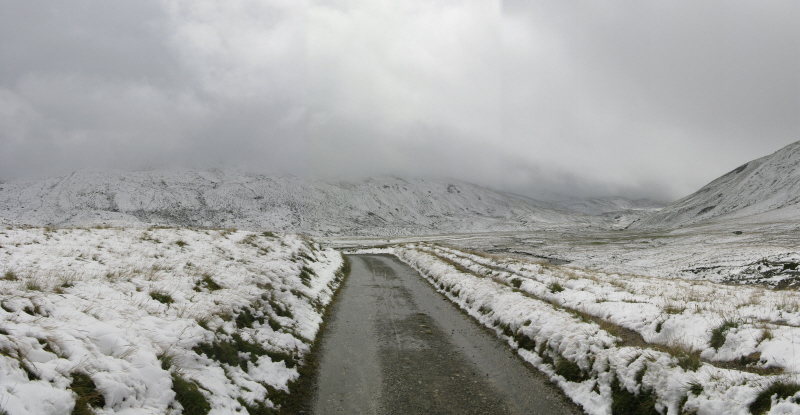 In winter, in remote places some herds follow you because they think you are the farmer with food/straw. 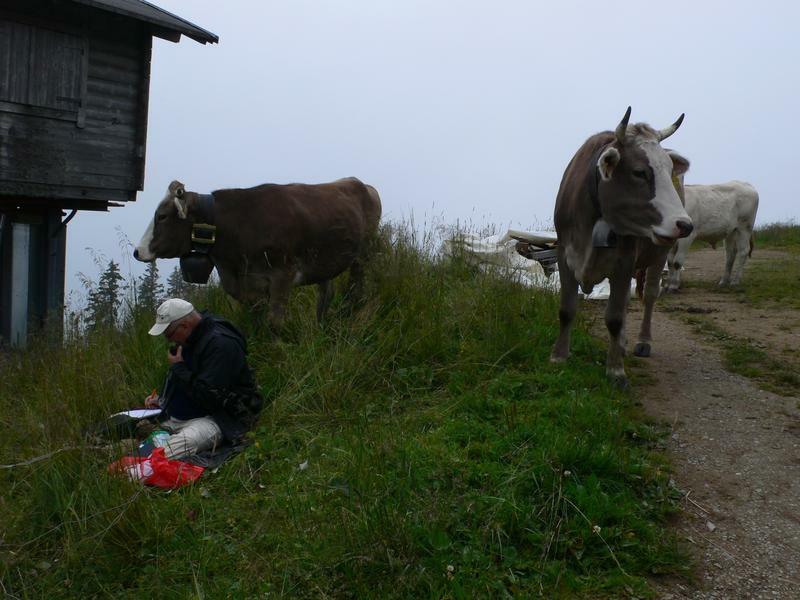 Once I had to move elsewhere in the activation zone to avoid cows who were already ‘activating’ the summit. 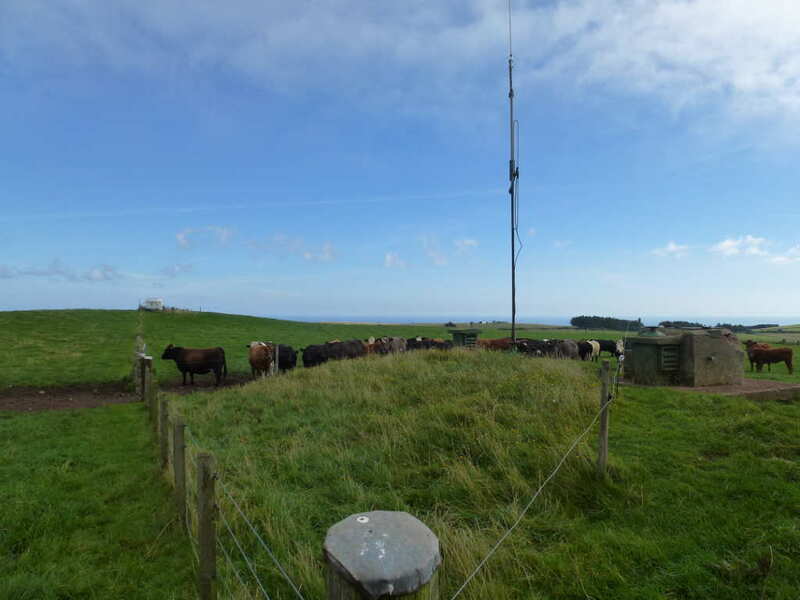 After QSO’ing for a while I looked up to see they had moved to surround me but at a respectable distance. At that time I used radials, and my tuner moved away via a wire. They also liked likking my bagpack. SOTA has more dangers than tumble down the summit only. My xyl made the picture and told me a bit late that the cows came from behind me. A farmer told me that female cows with calves are more dangerous than bulls. Horns or no horns, they are very heavy. Never get yourself between a cow and its calf. The cow will become extremely aggressive if you do! The cows stopped at the gate in the fence and didn’t enter my field even though the gate was held open. Later on they came up to the fence post at the bottom centre and looked over at me. I think they were checking on my Morse because they all wandered away shaking their heads after a few minutes. On Labenberg a fence keeps cattle out. Wow, all the cows I’ve encountered in the US have been friendly. They always move out of my way if they’re standing on the trail, and run away half the time. In my first time in the Alps, without experiences, I was yelling abrupt and loud and the cow was scared and jumped back quickly. It looked absolutely not save. I don’t want to cause an injury to the cows and be now more careful. Normally cows are only curious and sometimes annoying. grassland in my back than only with a lot of nothing . Some waiting solved the whole problem. awoke and the whole landscape was white. We’ve got 5 cm snow over night. I made a walk to Pass da Sett on a good and save country lane. The wind near the pass was more a storm but all was save - until on the way back I reached a bridge over a strong mountain stream. In the middle of the bridge stood a bull, stood still minute after minute. It was clear, he was the boss and owner of the bridge. I had no hope for permission to pass and no wish to being wiped from the bridge in the stream. Near the bridge I saw some stones in the stream and jumped from stone to stone, with hope not to slip and fall in the refreshing water. trail. I don’t know what will happen. And I don’t want to test it.